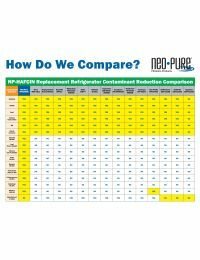 The Neo-Pure NP-HAFCIN is compatible as a Samsung® refrigerator water filter. This new economical alternative to the pricier OEM option is a robust solution for better-tasting water that is free of impurities. The NP-HAFCIN passes water through an activated carbon core dotted with sub-micron pores. This innovative formula is designed to reduce harmful impurities like alead, chlorine, asbestos, and mercury. The filter cartridge is made out of 100% BPA-free polypropylene exterior. This refrigerator water filter also features fitted O-rings and a custom mold to ensure a tight fit and leak-free installation in your Samsung refrigerator. The NP-HAFCIN is certified by an independent laboratory to meet NSF Standard 42 for material and engineering integrity. NSF requirements protect the health and well-being of you and your household. Refreshing. Cleans and polishes the taste of your water. Over 97% efficiency. Activated carbon core reduces lead, chlorine, VOCs and pesticides. Environmentally-friendly. The carbon is made out of charred coconut shell, a renewable resource and friendlier alternative to coal mining. Designed by experts. NeoLogic Solutions is a global water filtration company with an impeccable reputation for quality. BPA-free materials. 100% polypropylene cartridge is free of cancer-causing materials. 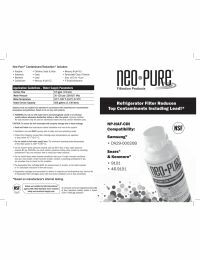 NSF Certified The Neo-Pure HAF-CIN compatible filter has been manufactured to NSF Standard 42 engineering standards. 100% Fit Gaurantee The NP-HAFCIN has been designed for 100% leak-free fit in your refrigerator. 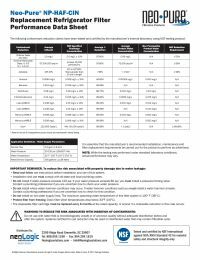 Per manufacturer recommendations, your filter should be replaced every six months or 300 gallons. The indicator light on your refrigerator is timed to remind you to change your filter, and should be minded for optimal performance. 1. Locate the water shut-off valve, which is located behind your refrigerator. Turn the valve to turn off water to the fridge. 2. Locate and remove your old refrigerator water filter inside your refrigerator. In Samsung refrigerators, this will either be located between the crisper drawers or to the side. To remove the filter, firmly turn 90° counterclockwise to release from the filter holder. 3. Insert the new NP-HAF-CIN filter and turn 90° clockwise to lock into place. 4. Turn the water supply back on by turning the valve. 5. Flush the new filter by running 1-2 gallons through the filter and dispenser. This removes any carbon fines and air bubbles in the lines. 6. Reset the filter indicator light by pressing the RESET button and holding for 3 seconds.